An estimated 2.4 million U.S. service members were exposed to some level of Agent Orange in Vietnam between 1962 and 1971. The U.S. Department of Veterans Affairs (VA) backlog of Agent Orange disability cases is currently estimated to be at around 500,000. With the number of VA claims increasing every year for diseases associated with Agent Orange exposure, competition is tough. It is important that American veterans understand how to win these disability compensation claims for Agent Orange exposure. Even if your disease is not on the VAs list of presumptive diseases caused by Agent Orange exposure, you can win your VA claim for benefits. Here’s how step by step. How Does Agent Orange Cause Disease? Most veterans who served during the Vietnam War are familiar with the toxic herbicide, Agent Orange. Between 1962 and 1971, the U.S. Military sprayed 12,000 square miles of Vietnam forests with over 20 million U.S. gallons of defoliant in an herbicidal warfare effort, resulting in major – often deadly – consequences for over 1 million Vietnam vets. Because the VA bases most of their decisions around claims on medical and scientific evidence of Agent Orange causality, a brief understanding of how Agent Orange affects the human body is important. Agent Orange contains a toxic contaminant known as TCDD, classified by the U.S. Environmental Protection Agency (EPA) as a human carcinogen (causes cancer). TCDD is a dioxin that easily enters the body through touch or ingestion. In the body, TCDD travels to the cell nucleus where it damages genetic material. This genetic damage leads to a variety of cancers and other illnesses, symptoms of which may not show up for 50 years or more. Researchers also suggest TCDD causes birth defects in the children of those exposed to Agent Orange. Were You Exposed to Agent Orange During Vietnam Service? Reviewing a brief history of the use of Agent Orange can help determine whether you were at high risk of exposure during service. 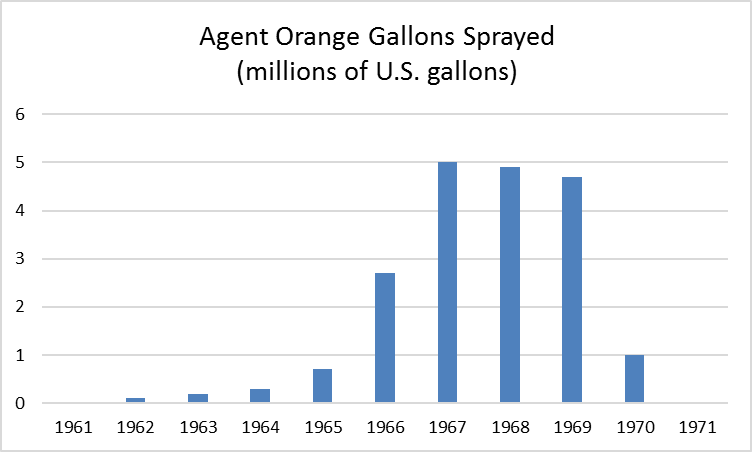 Agent Orange development started back during World War II. In 1943, the U.S. Department of the Army hired Arthur Galston, a graduate student in the University of Illinois at Champaign-Urbana’s botany department to study the effects of Agent Orange chemicals on grain crops. The idea was to eventually find an herbicide to use in destroying enemy food supplies and removing vegetative cover. Britain was the first to use Agent Orange in herbicidal warfare during the Malayan Emergency of the 1950’s. Using Britain’s actions as precedent, the U.S. decided that the process of spraying large enemy areas with defoliant should be a legal strategy in war. In November 1961, President John F. Kennedy authorized a U.S. Air Force herbicide program in Vietnam – codename Operation Ranch Hand. The U.S. military produced millions of gallons of the herbicide, labelling the barrels with a large orange stripe – hence the name. Beginning in January 1962, U.S. helicopters, boats, trucks and C-123 transport planes sprayed nearly 18% of South Vietnam’s forests, plus parts of Cambodia and Laos, with various herbicides, with peak sprays between 1967 and 1969. And the military didn’t tread lightly. Spray mixtures held over 13 times the concentration of defoliant recommended by the UDSA for domestic use. In some areas, TCDD soil concentrations were 180 million times higher than levels considered safe by the EPA. Concerned about the serious health and environmental effects, Arthur Galston himself and other dioxin toxicity experts opposed Operation Ranch Hand. In 1966, United Nations resolutions suggested the U.S. was violating the 1925 Geneva Protocol by carelessly spraying the toxin over wide areas of land. The U.S. argued that, since Agent Orange was merely a herbicide and defoliant, it should not be considered a chemical or a biological weapon. The argument worked and the U.S. continued spraying Agent Orange. It was not until 1971, after scientists began protesting the use of Agent Orange using evidence of cancers and birth defects in laboratory animals, that the spraying stopped. Blood tests done in the 1970s confirmed toxic levels of TCDD in U.S. military members who served in Vietnam. 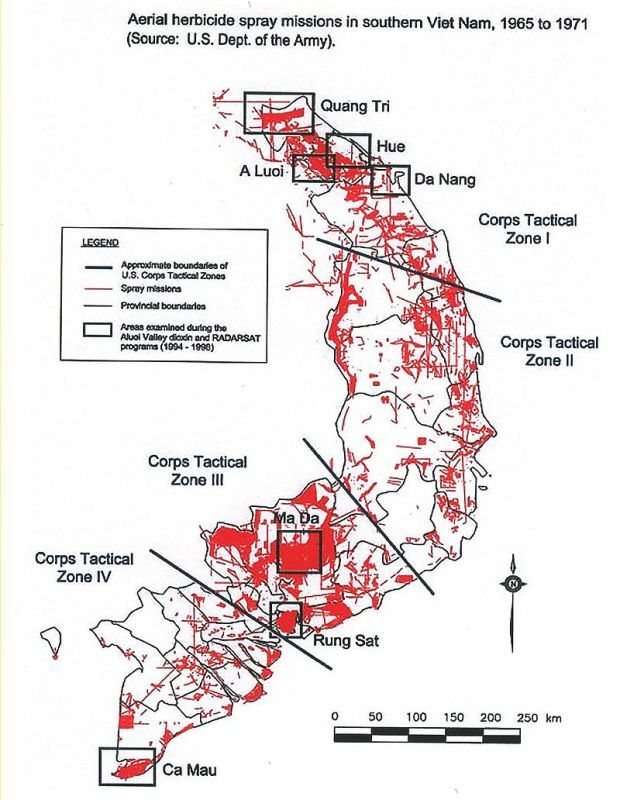 Studies found the highest levels of TCDD exposure in those living and working around the Vietnam - Cambodia border and the Long Mountains near Truong Son. The VA presumes that any veteran who served in Vietnam between January 9, 1962 and May 7, 1975 was exposed to Agent Orange. But Vietnam veterans aren’t the only ones who can file a claim for disability benefits due to Agent Orange exposure. When Operation Ranch Hand ended in 1971 and the spraying of Agent Orange stopped, the military reassigned C-123 planes used for spraying to East Coast USAF Reserve squadrons for use in routine airlift missions. But these planes were still heavily contaminated with Agent Orange. Because of this, non-Vietnam veterans working in and around these planes in the U.S. between 1972 and 1982 are also eligible for compensation due to Agent Orange exposure. In addition, veterans stationed at the Navy’s Camp Garcia bioweapons site in Vieques, Puerto Rico during the 1970’s may also have been exposed to Agent Orange. I recently helped client and friend, Marine Sergeant Hermogenes Marrero, win his appeal for benefits due to Agent Orange exposure after working in this location in hazardous airborne chemicals testing between 1970 and 1972. In 1980, the New Jersey Agent Orange Commission and Rutgers University organized The Pointman Project, a research project to study the health effects of Agent Orange. Scientists found that blood and adipose TCDD levels were higher in Vietnam veterans, including Marines, Army and Navy members, than individuals not exposed to Agent Orange. As early as 1977, Veterans began to file claims for disability payments to the Department of Veterans Affairs (VA) with the belief that Agent Orange exposure caused their health problems. If the veterans couldn’t prove their problems began during service or within one year of discharge, the VA denied their claims. In 1991, after scientific evidence showing that symptoms of Agent Orange toxicity can take decades to appear, Congress enacted the Agent Orange Act. Under the Act, the VA declared a specified list of health conditions as 'presumptive' to Agent Orange exposure and could grant treatment and compensation to Vietnam veterans with these health conditions. But the list of presumptive conditions was small. By 1993, the VA had received over 39,400 claims from soldiers exposed to Agent Orange, and granted compensation to only 486. During the Vietnam war, the government ignored warnings from researchers and told our soldiers that the herbicide being sprayed all around them was harmless. Now, our veterans are experiencing the tragic, disabling effects of the toxin. Ongoing research by the National Academy of Sciences and further scientific evidence is associating more and more diseases with Agent Orange exposure. And if these conditions are service-connected and productive of total disability, then a veteran can file for TDIU or individual unemployability if his service connected conditions prevent him from working. Diseases like these may be more aggressive in individuals exposed to Agent Orange than in unexposed patients. 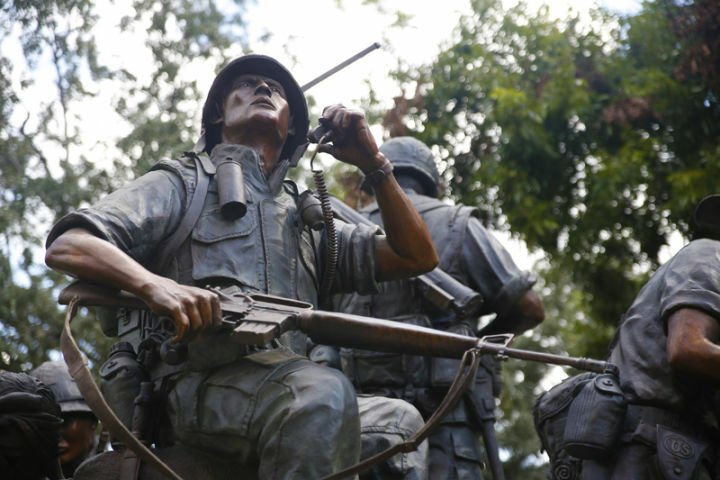 Recent research suggests that prostate cancer is twice as aggressive in veterans exposed to Agent Orange. In addition, because of the genetic impact of Agent Orange exposure, many children of Vietnam veterans are inheriting the toxic effects. Research with the Huế College of Medicine in Vietnam suggests that children of military personnel who served in Agent Orange affected areas are at higher risk of being born with mental disabilities, cleft palates, hernias and polydactyly, among other health issues. The VA already grants benefits for children born with spina bifida if a parent was exposed to Agent Orange during service. Many other cancers and illnesses that the VA doesn’t included on its list of presumptive conditions may still be linked to Agent Orange exposure. With solid scientific evidence and medical expert opinion, any veteran with these conditions may be eligible for VA benefits due to exposure to Agent Orange during service. Currently, myoproliferative neoplasms (MPNs) like myelofibrosis, essential thrombocytopenia and polycythemia vera are not on the VA’s presumptive list. Yet more and more veterans are developing MPNs according to MPN Advocacy and Education International. Hematologic oncologists with Memorial Sloan Kettering Cancer Center are now studying the association between MPNs and Agent Orange. According to the VA, over 300,000 Vietnam veterans suffer from hypertension. In 2006, a study published by VA researchers in the Journal of Occupational and Environmental Medicine found that U.S. Army Chemical Corps veterans exposed to Agent Orange were at higher risk for developing hypertension. The addition of hypertension as a disease associated with Agent Orange exposure could mean secondary service connection for kidney failure, stroke and other problems associated with hypertension. While the VA has not yet added hypertension to the list of diseases associated with Agent Orange exposure, scientific evidence may be strong enough to win a claim for benefits for this health condition. The CDC and VA are now examining whether an association exists between Agent Orange and chronic pulmonary obstruction disorder (COPD), along with other respiratory disorders. I recently helped a widow win retroactive pay of nearly $100,000 after the death of her ex-husband, a veteran who died of lung cancer from Agent Orange exposure during service. In March 2016, the National Academy of Sciences’ Institute of Medicine (IOM) released a review of health problems linked to herbicide exposure. Of 1 million Vietnam veterans, doctors diagnosed 1,833 with Parkinsonism, 5,484 with bladder cancer and 15,983 with hypothyroidism. Parkinsonism, not to be confused with Parkinson’s disease, shows symptoms similar to Parkinson’s symptoms – including rigidity, tremors, postural instability and bradykinesia. Currently, a diagnosis of Parkinson’s disease creates eligibility for presumptive service connection. Not so with Parkinsonism. The IOM review concluded that there is no rational basis for excluding Parkinsonism from the presumptive list. With this evidence, veterans with Parkinson’s-like symptoms should be able to collect VA benefits associated with Agent Orange exposure. I’m a strong advocate for adding pancreatic cancer to the presumptive list after seeing many Vietnam veterans lose their lives to pancreatic cancer - veterans who have no risk factors for developing pancreatic cancer other than Agent Orange exposure. While pancreatic cancer is not on the VAs list, our veterans benefits law firm has been able to win service connection for a veteran diagnosed with pancreatic cancer associated with Agent Orange exposure using strong medical and scientific evidence. The most reliable method of proving service connection for pancreatic cancer is based on a secondary relationship between existing service-connected type 2 diabetes. Usually, a long-standing type 2 diabetic condition that pre-dates the pancreatic cancer diagnosis is the strongest basis for a claim. In the case referenced above, the veteran died within 26 days of diagnosis. His widow filed a claim for service connection for the pancreatic cancer, arguing that diabetes from Agent Orange exposure caused the cancer. The VA denied her claim. She appealed for 14 years, until calling us. With the help of our medical experts and extensive review of scientific research, we helped her win the claim for service connection and VA compensation. We have met with many Vietnam veterans who suffer from a variety of neurological conditions, organic brain syndrome and brain damage because of exposure to toxins. Scientific evidence shows that serious neurological issues can result from exposure to Agent Orange. Even though these conditions are not on the list of Agent Orange related diseases, we have helped countless Veterans obtain service connection for conditions involving neurological and brain disorders. Doctors are diagnosing more and more Vietnam veterans exposed to Agent Orange with glioblastoma multiforme and other brain cancers. Data from the VA shows that more than 500 Vietnam veterans have been diagnosed with glioblastoma at VA hospitals since 2000 (this number doesn’t include the unknown number of Vietnam veterans diagnosed at private hospitals). From 2000 to 2007, VA doctors diagnosed between 22 and 31 Vietnam veterans with glioblastoma each year. From 2008 to 2013, the numbers doubled to 45 to 61 veterans diagnosed annually (while non-Vietnam veterans’ diagnoses showed no change). This jump could be due to the incubation time needed for glioblastoma to develop, or to the increase in Agent Orange sprays seen between 1967 and 1969. With strong medical and scientific evidence backing them up, Vietnam veterans and their widows who can show that the brain cancer was caused by Agent Orange exposure during service could be eligible for tens of thousands of dollars in retroactive compensation. Since 2009, wives of deceased husbands have won around 24 brain cancer VA cases out of 100, even though brain cancer isn’t on the list. View our video to learn more on how to establish service connection for cause of death. Never give up on your claims or appeals. Scientists release new evidence daily regarding the association between Agent Orange and diseases not on the list. And you can use that evidence to support your claim. With access to the nation’s top medical experts and intensive examination of the scientific literature, our veterans’ disability lawyers at Gang & Associates, LLC are successful in winning these claims for many veterans. Between 2002 and 2015, the VA awarded benefits for Agent Orange exposure to over 650,000 veterans. Not surprisingly, this number is growing fast. An estimated 2.4 million U.S. military members were exposed to some level of Agent Orange in Vietnam. In 2015, the VA released data showing the projected increase in demand for VA benefits, noting that 40 years after the end of the Vietnam War, veterans receiving disability compensation has not yet peaked. For the past 40 years the percentage of veterans receiving benefits has held at a consistent 8.5%. But over the past 15 years, percentages have risen to 19%. Many Vietnam veterans are now reaching the age where Agent Orange exposure is causing ischemic heart disease, prostate cancer and type II diabetes. Because of this expectation, the VA is planning for an increasing volume of claims. Deadline has elapsed since discharge and the first documentation of a claimed disability. Veteran is not a doctor and therefore not competent to offer opinions of medical causation or diagnosis. Medical condition did not appear during service or for many years after. Veterans' separation physical exam showed normal findings on clinical examination. Doctor did not review the claims file and thus his report is less probative. Remember, never give up if the VA has denied your claim. Many veterans win benefits after several rounds of appeals. A qualified veterans’ disability benefits lawyer can help you appeal the decision and make the case for why you deserve disability benefits. View our video for more information on how to choose a qualified VA disability appeals lawyer. For many disabled veterans exposed to Agent Orange, winning service connection for a disease not on the VA’s list can seem impossible. Many veterans call our veterans benefits law firm with various forms of cancer and other rare diseases that are not on the VA’s list of presumptive illnesses who have been unfairly denied by the VA again and again. Yet, most of these cases can be won. The key to a successful claim for VA benefits covering a disability associated with Agent Orange exposure is to carefully-craft the legal and medical strategy the VA expects. Strong medical and scientific evidence is indispensable in winning service connection due to Agent Orange exposure for a disease not on the Agent Orange list. You must be able to show that the unique features of your disease and how it manifests compels the conclusion that your disease could only have resulted from exposure to a toxin like Agent Orange. Normally, the scientific research requires a higher degree of proof than that needed to prove service connection. For example, medical science may not recognize causation unless researchers find a high degree of certainty. But for VA purposes, we just have to show that the service-related cause is 50% probable. Understanding this difference - and educating the medical experts on this distinction - is vital to success in these cases. Most of us aren’t medical experts or research scientists and don’t know anyone who is. So how does a veteran find these experts and how much do they charge to help with a case? The fastest way to gain access to the best medical experts and appropriate scientific literature for your specific case is to hire a veteran’s disability lawyer with access to the nation’s top medical and scientific experts. Our veterans disability lawyers with Gang and Associates even pay for the guidance of these experts up front, so you don’t have to worry about the cost until you win your claim. At Eric Gang and Associates Law Office, we develop a comprehensive legal strategy based on sound legal and medical research. Our success centers around the opinions of leading U.S. medical experts and scientific research. Learn more about how to obtain a qualified medical expert in our video. If the VA or Board of Veterans Appeals has denied your claim for a disease related to Agent Orange exposure, call our office. We have helped hundreds of veterans get the benefits they need and deserve. Gang & Associates has litigated more than 700 appeals at the U.S. Court of Appeals for Veterans Claims and has recovered over $7.5 million on behalf of disabled veterans. Contact us today to learn how we can help you win veterans disability benefits. 888.878.9350 or Use This Online Form.